Just as the sun was about to hide behind the buildings of Ortigas’ skyline, a silhouette of a man, sprinted across the back straight of the oval ULTRA. He’s been doing that for a good 30 minutes already – 400m intervals with about 10-20secs rests in between. Here in the Philippines, athletes who are doing track workouts in the oval are either college players or national players. Its quite unusual to see a non national athlete doing such workouts. After finishing his workout, the 5’10” athletic built man sat in the bleachers stands and gave me a handshake. Current Philippine Record Holder for the 800m, John Lozada, is now ready for an interview. I gave him my questions two weeks in advance, I am sure he has prepared his answers with specific info to back it up. This is the third installment of our Interview with Pinoy Legends Series: John Lozada – King of Pinoy Half Mile. 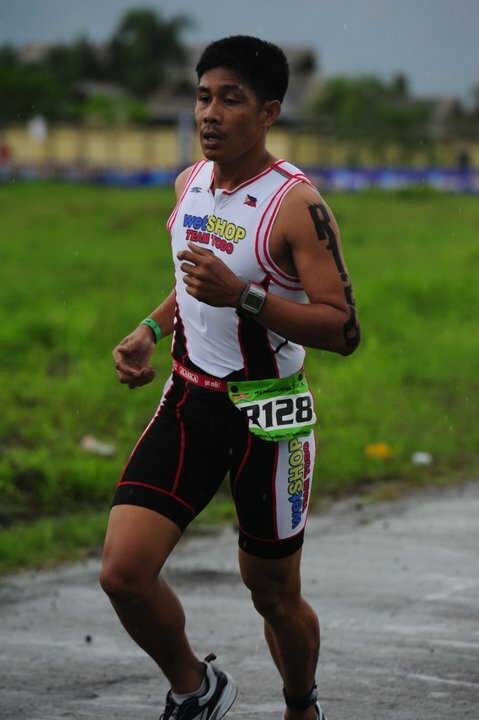 Pinoymiler: Among your medals and titles, what is the most important to you? 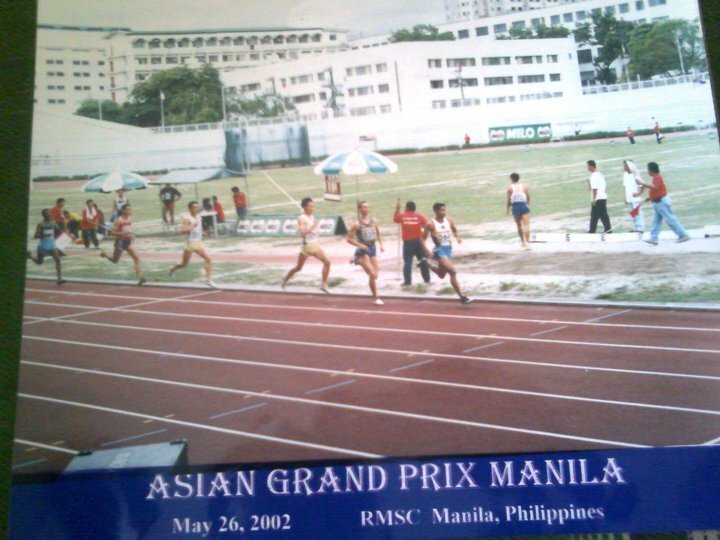 John Lozada: My 2001 SEA Games gold medal in the 800m. Its special because it’s one of my fastest time – 1:49.39 and my first SEA Games gold. (He brought home 2 silvers in the 1999 SEA Games). P: What medal or title did you aim for but failed to achieve? J: An Asian Games Medal. My best chance was in 2002. I was one of the favorites to win a medal. The top seed was a Korean but the difference in our best times that year was less than half a second. I just set the RP record of 1:47.77 5 months back. But I finished outside of the medals (8th place) because I ran the first lap in a fast 51 seconds. I was disturbed that time because I almost did not race in the finals. The organizers decided to scratch the semis and make it straight to finals due to the low number of participants. The coaching staff did not confirm my name. Good thing GTK was able to pull some strings, I was allowed to join the finals. But I was only advised of my participation less than an hour before the 800m finals. So I was furious at that time. I finished the race with a time of 1:51.09. My worst race in my career. P: You broke Isidro del Prado’s 800m National Record in 2002, did you also consider aiming for the 1,500m record of Hector Begeo? P: How about in 2000, how did your Olympic trials went? J: I almost made the Olympic team. There’s only one slot left. And PATAFA will choose between me and Eduardo “Vertek” Buenavista. But the challenge was, we specialize in different events, me the 800m, and Buenavista the 3,000m steeplechase, how did PATAFA settled it? We were both sent to Hongkong to run in the Golden Mile road Race. Whoever finishes ahead of the other will get the slot. I lost by half a second to Vertek (with a time of 4:24). But I still think I could’ve done better for the country if I have been sent to the Sydney Olympics. Vertek’s performance was dipping during that time. The HK Golden Mile was held in March and I was about to peak in 2-3 months after that. P: Aside from your National Record and your SEA Games exploits, what are your career highlights? J: The 2001 World Indoor Championships (Lisbon Portugal) because thats my first real International Exposure. And the 2001 World Championships at Edmonton Canada. P: If you were the PATAFA chief, what are the top 3 things that you would like to do to improve the state of track and field of the country? J: a. Spread the coaches in the provinces – there are so many potentials out there in the provinces who have not exposed to organized meets. Instead of the traditional way of picking athletes during the Palarong Pambansa and Regional Meets, why dont we designate one coordinator per Region or even Province? b. Too much politics inside the organization – I will find ways how to unite the coaches. Each coach is supporting their own respective “talent”. I think the people in the top should control this culture/mindset. It’s destroying the sports. A lot of coaches have left the country because of frustration – Del Prado, De Rosas, Gallenero. And I will not be surprised if there will be more former national athletes-turned coaches who will seek employment outside of the country because of this. c. Improve athlete’s support – Our athletes need additional gears, vitamins, and financial allowance. P: What are your athletic goals in the next three years? J: I want to compete in the Olympics. I guess I am not competitive anymore as a middle distance runner. So I’m targeting an Olympics slot as a marathoner. My best chance is the 2012 London Olympics. So my training schedule now is geared towards that goal. John is currently in the active roster of Philippine Navy and is doing some sideline as Running Coach/Trainer for novice runners at the ULTRA.